﻿ V type PTFE envelope gasket - China V type PTFE envelope gasket Supplier,Factory - Cixi Aiflon Sealing Materials Co.,Ltd. 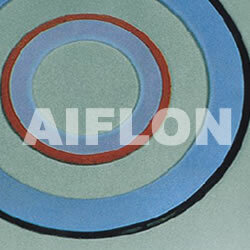 Aiflon PTFE Envelope Gasket consists of asbestos, non-asbestos, rubber etc. cushion material having exposed surface covered with PTFE envelope. Depends on excellent corrosion resistance and compression resilient. It¡ˉs widely used in strong alkalis, cryogenic fluids, oxygen, chlorine gas and disallowable polluted medium etc.